Everyone loves movies. It's a favorite pastime, a couple's complete romantic evening, friends awesome outing where they can all agree to do together. 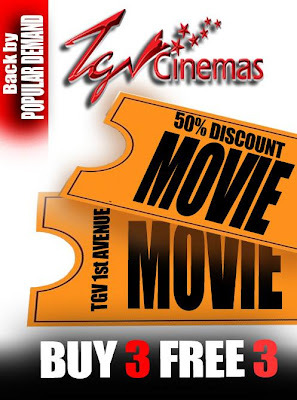 Now TGV 1st Avenue in Penang, through EziVoucher is offering a buy 3 free 3 tickets to customers!!! That means, in math freaks' term, it'll be 50% off 6 tickets, a total of RM36. There is no limit to how many any one person can buy. Movies that are eligible would be movies that aren't in 3D and not applicable to Couple Seats and the Beanieplex. For further terms and condition, please head on to the deal's page by clicking on the image above to avoid any hassle later. For the latest updates, go to EziVoucher's facebook page and click on the like button. Ahaha. Well, This one is you have to buy 3 then only will get 3 free.